On occasion, companies will send out rather nice press kits for the games they are promoting and publishing. 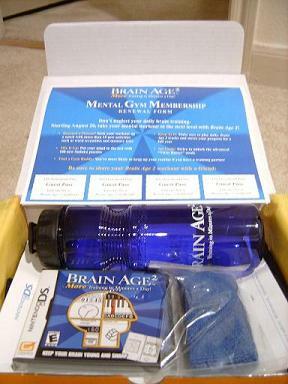 I have received a few in the past, but I think the coolest one I’ve received was for Brain Age 2 for the Nintendo DS. There’s a water bottle, a headband, totebag and a copy of the game, along with various press and fact sheets. Some people think these things influence a game’s score and review. I don’t doubt that it can happen, but if it does, that person shouldn’t be reviewing games. Instead, he should be reviewing promotional materials and other fanfare and accompaniments that go along with a game. If a game is crap, I’ll give it the score it deserves.